July 5, 2004, when the Decatur Area Arts Council moved into the Madden Arts Center, the dream of a lively active arts center in a very visible downtown location became a reality. Now, ten years later, we have compiled a list of the top 10 reasons why the Madden Arts Center is a vital part of downtown Decatur. #4 - We bring the world to Decatur. The first thing you experience when you walk into the Madden Arts Center is the beautiful Anne Lloyd Gallery. As a major part of the original vision, the gallery has become the crown jewel of the Center. Folks who have never seen it are often struck by the size and elegance of the space. They are surprised to find something like it in downtown Decatur, Illinois. Exhibiting artists from Chicago, St. Louis, and beyond are impressed by and grateful for the opportunity to display their work here. It is through these artists that the Anne Lloyd Gallery brings the world to Decatur. The range of exhibits in the Anne Lloyd Gallery has been mind-boggling, with something for everybody’s taste, including street art, comic books, and recycled art. Even after ten years, Gallery Director Sue Powell and the selection committee continue to find prominent local and even international artists to feature in a different exhibit every month. Supporting home-grown talent has always been a focus of the gallery. Lots of local artists have had solo exhibits, like watercolorist Rob O’Dell, painters Don Guber and Cindy Lewis, and sculptor Peter Smith-Phillips, to name just a a few. Annual shows, like the Barn Colony Artists show in May, Gallery 510’s October National, and the Xmas ARTicles Holiday Shoppe in December, also give Decatur-area artists the opportunity to display and sell their work in the gallery. Even creative young students get a monthly exhibit with the Young Artists Showcase in January. 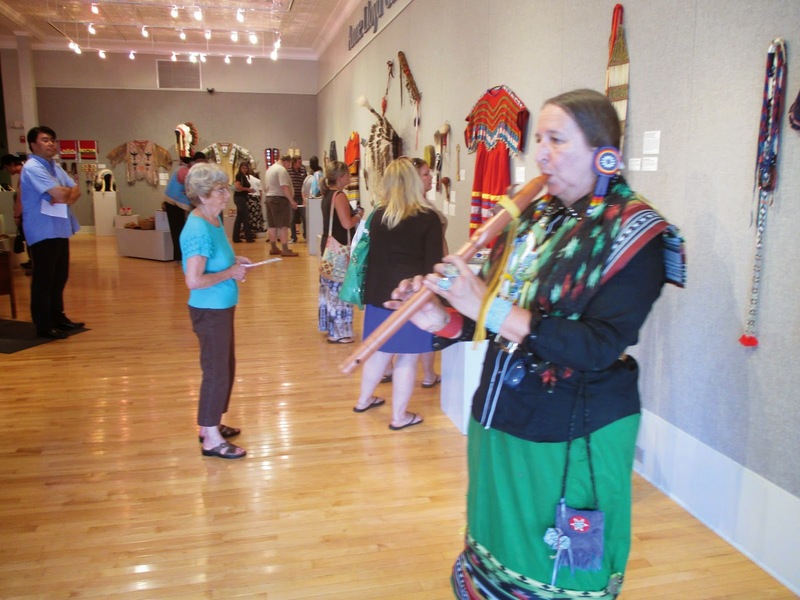 But the Anne Lloyd Gallery offers up its share of national and international art and culture, particularly through the annual International Arts Experience exhibits each summer. These exhibits don’t just have beautiful examples of art and artifacts from cultures as diverse as Japan, Brazil, India, and Native American. They combine traditional visual displays with astonishing performances of music and dance, compelling storytelling, and mouth-watering samples of food. The Anne Lloyd Gallery serves as a centerpiece for the arts experiences of the citizens of Decatur. Hundreds of people come together in the gallery for the opening events on the first Friday of each month. Kids on field trips see and learn things on their visits here that they may not get in their regular school lessons. Every day, downtown visitors and shoppers stop by this oasis of creativity in the heart of our city and leave refreshed and inspired. But, maybe the most impressive fact about the Anne Lloyd Gallery is that all of the things it has to offer are provided to our community free of charge... thanks to the generosity of those who support the Decatur Area Arts Council. Since being transformed into the Madden Arts Center in 2004, the building at 125 N. Water St. has become a hub of activity in downtown Decatur. Every month, on average 1,000 people pass through our doors on their way to a gallery show, class, meeting, or performance. Built in 1902 by wealthy clothing businessman John Race, a number of businesses have come and gone at this location, including jewelers, opticians, a beauty school, and a variety of clothing retailers. If you stand back and look at the architecture, you can see that the buildings at 125 and 131 N. Water St. are actually two halves of the same structure. Over the years, much of the building has been vacant. Most of the time, the upper floors were vacant. In 1991, Theatre 7, Decatur’s community theatre, purchased the northern half of the building. This was one of the reasons the Arts Council chose to buy the southern half of the building. The idea that these two organizations could potentially be the beginning of an arts district in downtown Decatur was very appealing, bringing new life to an aging structure. There was one particularly successful business in the building’s history that seemed to defy the odds and became synonymous with outstanding service and quality merchandise at a reasonable price, Sam Loeb’s clothing store. In 1933, in the midst of the Great Depression, Sam Loeb bought the Bright Brothers clothing store at 125 N. Water St. Though he was only 23 years old, Loeb went on to run the store for 55 years, 1933-1988. Lots of folks in Decatur have fond memories of shopping in Loeb’s store. They remember not only the efficiency and knowledge of the staff, but their kindness and good nature. Which was no doubt the secret to the store’s longevity. We at the Decatur Area Arts Council are proud to continue this tradition of dedication and service to our community. We are particularly proud that we can do it in a historic downtown building that has such a rich history. While some buildings have given way to fire or the wrecking ball, 125 N. Water St. continues to thrive in the heart of our city as the Madden Arts Center.